contributor also receives a thorough critique from the other two authors. 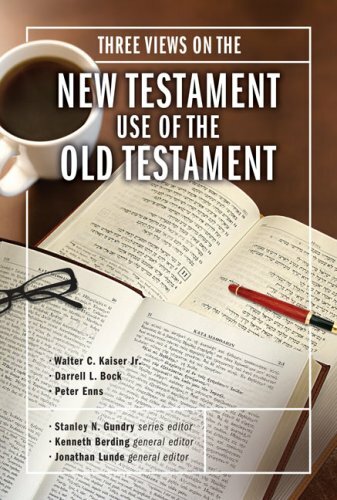 A one-stop reference for setting the scene and presenting approaches to the topic that respect the biblical text, Three Views on the New Testament Use of Old Testament gives readers the tools they need to develop their own views on this important subject. The Counterpoints series provides a forum for comparison and critique of different views on issues important to Christians. Counterpoints books address two categories: Church Life and Bible and Theology. Complete your library with other books in the Counterpoints series. Samuel Waje Kunhiyop is General Secretary of ECWA (Evangelical Church Winning All) and a visiting Professor of Ethics at Brigham University, Karu, Nigeria. He was previously Head of the Postgraduate School, South African Theological Seminary, and Provost and Professor of Theology and Ethics at Jos ECWA Theological Seminary (JETS). He holds a BA (JETS), MAET (Western Seminary, Portland, Oregon), and the PhD (Trinity International University, Illinois). Darrell L. Bock (PhD, University of Aberdeen) is research professor of New Testament studies at Dallas Theological Seminary. Known for his work in Luke-Acts, Dr. Bock is a Humboldt Scholar (Tubingen University in Germany), an editor-at-large for Christianity Today , and a past president of the Evangelical Theological Society (2000-2001). A New York Times bestselling author, Bock has written over thirty books, including Luke in the NIV Application Commentary series.